Our dining table was oval… a rectangular table tennis table was a dream! As a child I did lots of sport. When I was young we tended to organise our own “events”. We’d play football into the dark winter evenings, play cricket through the long summer holidays, compete in “do it yourself” athletics challenges, play table tennis on the dining room table and participate in epic snooker matches on our child-sized tables, and participate in any other sport we had the chance to. As I got older, I did more and more organised sport providing structured competition, regular training and coaching. In summary, Sport was an important part of my life. 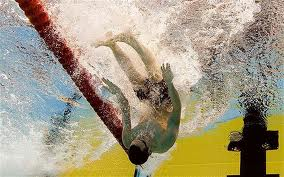 One sport I never did competitively was swimming. After having been taught to swim by my parents, it was strictly a “fun” activity. While my evenings and weekends were fairly busy, my morning activities were limited to getting up, eating breakfast and getting myself to school. For me, there was no pre-school training that swimming seems to require. Swimming “competitions” were limited to low key school galas and attempts to gain badges and / or certificates to record my achievements. Having never really got into it as a child, swimming has never been a feature of any previous attempts to get fit as an adult. It always seemed like too much work. An inefficient, and potentially embarrassing, way of getting exercise that I could get much more easily on dry land. As a result I have never swum any significant distances. Turning isn’t a strong point for me either! It all tends to be a bit hit or miss! Things have changed a little in recent weeks as I’ve added swimming to my regular exercise regime. I recognise that I’m not getting any younger, and now seems like a good time to overcome my prejudices and inadequacies (in relation to swimming at least!) and learn to swim properly. My first few weeks were spent doing single 25m lengths, in sets of one. I tended to reach the end of each length short of breathe and needing a rest. Stepping up to doing sets of 50m was a big deal. Again, the second (and final) length always seemed to be more difficult than it should. For some reason moving beyond 50m proved to be a big psychological barrier for me. Perhaps it was because I’ve never swum 100m without stopping before (at least as far as I can remember). The chances of successfully turning after the second length seemed slim. Completing a further two lengths seemed almost a physical impossibility. 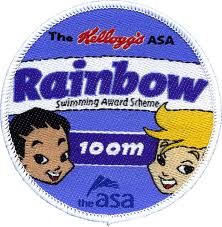 So, my successful attempt to get my 100m badge on Friday morning resulted in a fair amount of satisfaction! It wasn’t easy, but I’m hoping it will mark the beginning of a new phase of my swimming career. I’m not looking to compete competitively, but it would be fantastic if I could build up to being able to swim for an hour without stopping. This entry was posted in Exercise & Fitness and tagged 100m Badge, Exercise, Fitness, Freestyle swimming, Healthy Living, swimming, Swimming lessons on November 16, 2013 by Paul Squire.